Bridget Turan joined the Community Foundation in January 2019 as part of a new initiative with Volunteer Mississippi. 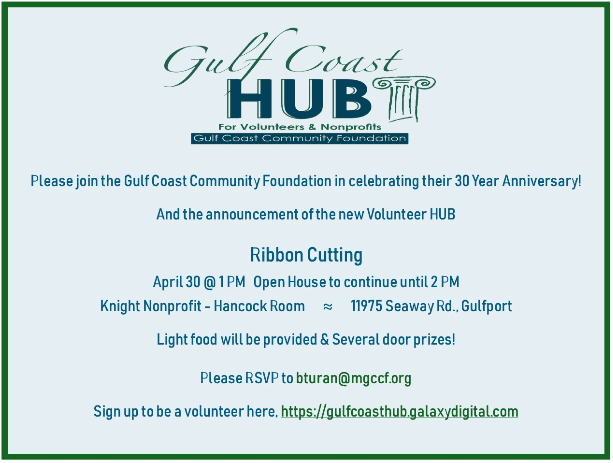 Bridget directs the Gulf Coast Volunteer HUB, that works to provide nonprofit organizations in Hancock, Pearl River, Harrison, Stone, Jackson, George and Greene County with skilled volunteers and organizational training. Bridget received her bachelor of arts from the University of Central Oklahoma in 1998. Bridget has been involved in philanthropic work since college, working with the Girl Scouts of America, National Down Syndrome Society, and, most recently, the March of Dimes. We are looking for non-profit organizations and volunteers.